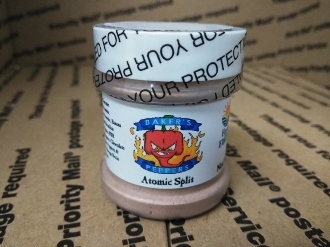 This is a very special premium gourmet DESSERT seasoning that was developed and created by Jennifer Baker! It is for those out there that have a bit of a "Sweet Tooth"! This is PERFECT for any dessert. From yogurt & custard to fresh fruit! From ice cream to fresh baked brownies! From home baked apple pie to cherry cobbler!! The possibilities are literally ENDLESS! Its flat out AWESOME on most any DESSERT you can imagine!!!! This blend contains an above average heat folks. It's intended to be a desert topper that is for the SERIOUS chili head! Its a bit spicy, with TONS of sweet & delicious fruit flavor paired with gourmet milk chocolate that is certain to change the way you eat ice cream..... for EVER!!!!! :) :) Order yours TODAY! This listing is for ONE (1) bottle containing 1 ounce of powder. It comes heat shrink vaccum sealed & with a 12 hole sifter cap under the lid for easy sprinkling.